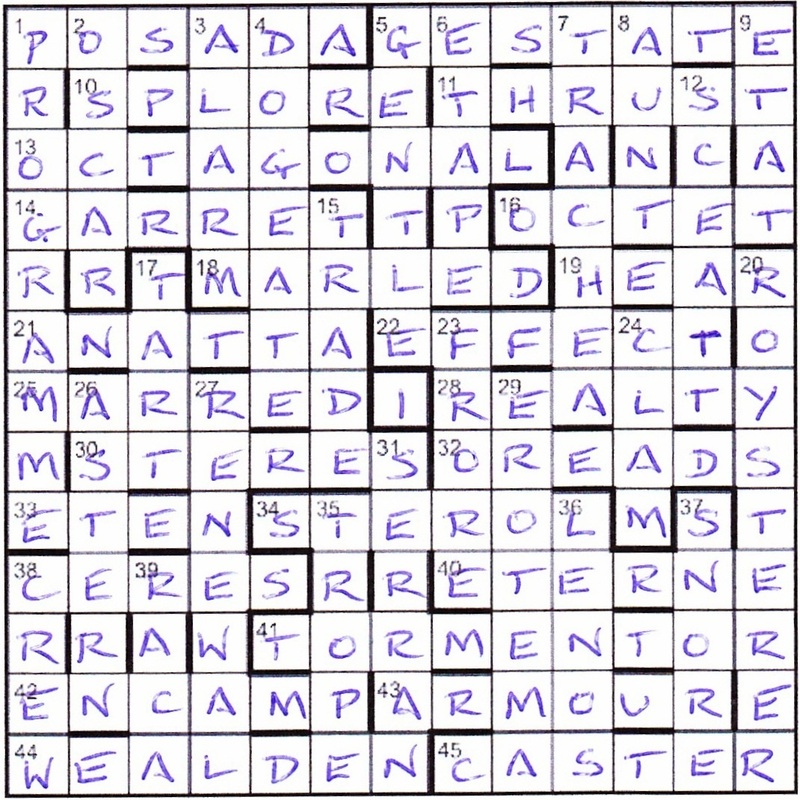 There have been mutterings on the ‘boards not to be mentioned’ that Listener crosswords were becoming too easy. I added a Numpty comment to one of them; “Be careful what you wish for; there is probably a Sabre in store or another Klein Bottle!” Prophetic words. We downloaded Sabre’s Identity Crisis and looked for our chessmen so that we could make a few realistic knights’ moves. But no, he did promise that the next one would be something different – and here it was. Of course, eight solving hours later (yes, it beat my four-day record on the Mash Klein bottle!) I know that even with his theme, Tristram Shandy, Sabre qualifies for Listener Oenophile Elite membership, but I did, nevertheless, scan his clues for the usual sprinkling of alcohol. What did I find? A gentle anagram including tea. ‘Odd notion, tea shifting moths (12) ODD NOTION TEA* giving NOTODONTIDAE. Then a smile as we find ourselves starring in a clue about PUNISHMENT (well, with Sabre, we knew we were in for that!) ‘Numpties finish in rush, and informally revised correction (10)’ (NUMPTIES [rus]H + ‘N*) (Finish in rush? You must be joking – it was 2 a.m. when I finished!). Next we find ‘Old bar: left over bottles disappear in the end (6)’ (SPARE ‘bottling’ [disappea]R giving SPARRE) So now Sabre is drinking up the dregs. ‘Struggle makes Brit a barman (6)’ gave us EFFORT and we finished with ‘Intoxicant leads to teen having crisis (3)’. This was clearly the abbreviation that was mentioned in the preamble giving us THC. We knew that we were aiming at a 12X12 grid with 180-degree symmetry and we soon had most of the long solutions, as these clues were on the generous side for Sabre, but immense problems loomed. It became clear that WITHSTANDING, for example, could not begin in the same column as UNFATHOMABLE and NOTODONTIDAE, as its initial coordinate was N and they were obviously going to begin in the column we had already identified as A because of all the solutions that had to begin there. It was thus clear that WITHSTANDING was to be shortened in some way, like, for example, QUARRYMASTER, which had, somehow, to fit in the same column, we assumed, as KAIM. Numpty head-scratching ensued. We had started with a 13×13 grid but, as the six-letter coordinates revealed themselves (we eventually had a putative AS SURE/ AND WHO/, SAID HE/, AND YOU and were able to guess at ARE YOU and AS I AM I) we had to revert to a 12×12 grid so that the bars we entered prompted us about the places where our clashes would appear. At this stage, the quotation sounded very much like a creation of Lewis Carroll, or of Edward Lear but it was not to be. It was only after a careful checking of the coordinates that I had enough clashing information to look up an anagram of (qua)RRYMAS(ter) and (w)ITHSTAND(ing) and with a hoot of joy was given TRISTRAM SHANDY by TEA. Of course the others followed: (stor)MWINDOW and ADWA(re) giving WIDOW WADMAN; (nai)LROD and SP(arre) giving DR SLOP; (ha)YRICK and (ror)O producing YORICK; (dou)BLY and CENTO(ist) creating UNCLE TOBY and ROOTL(ike) and CRAMPIR(on) finally producing CORPORAL TRIM. There it was; ‘DONT PUZZLE ME SAID I’ and it was inserted symmetrically at the foot of the grid creating new words, RASPS, IDANTS, TED and SPINOZA. Oh but this was impressive setting. Real words at the end of a puzzle always produce a murmur of approval. Two thing were left to do. We highlighted the cell that had contained the TRISTRAM SHANDY clash and checked with Chambers that we were inserting the letters of STERNE in cells where they made real words (STORE/ERES, QUARTER/WRING, NAIN/NARRE, TIKE/TON and HAE/RORE. What a compilation. Many thanks to Sabre. 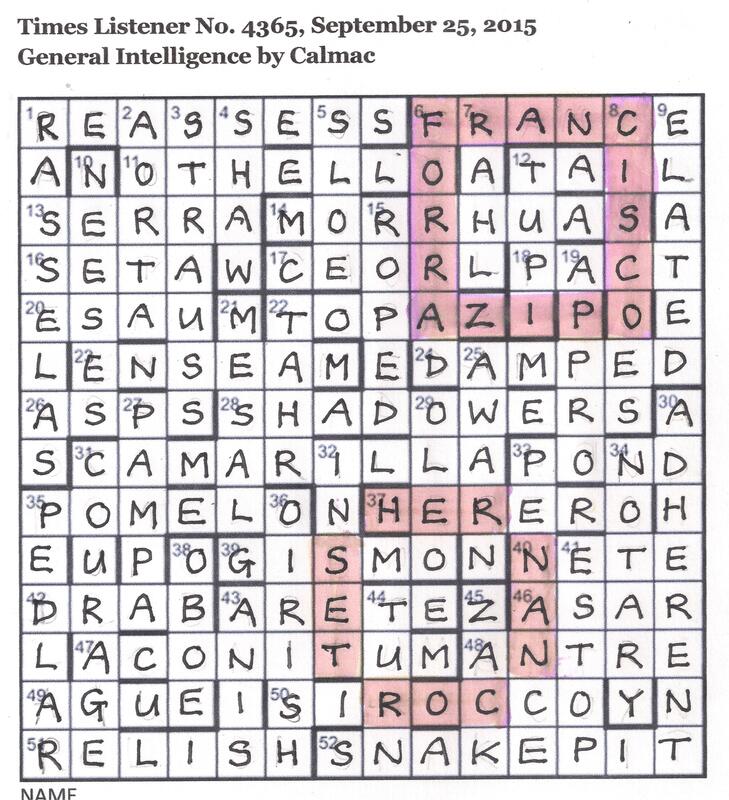 We immediately notice that blocked off cell in the centre of the grid and the preamble tells us that it is to be used ‘possibly’ to provide the answer to a question that will appear in those extra letters – that gimmick again! 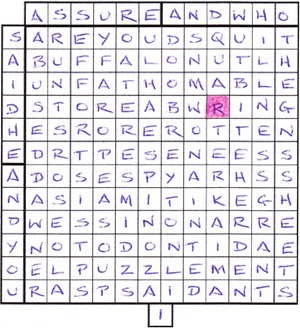 We draw our highlighted line along the side of all those clues (for those letters) and I scan the clues to check that Llig hasn’t retired from the Listener setters’ oenophile society. No need to read very far. In the very first clue, he is in ‘Manuel’s Bar‘ ‘A lot of money brought in by “faulty” soap. Manuels Bar (6)’ (SOAP* surrounding [W]AD gives POSADA). Alcohol must be flowing in the posada, as we find ‘Higher alcohol playing role that dogs drunkard (6)’ (S[O]T ROLE*) and ‘Gym with informal drink to follow day’s march in Bordeaux (5)’ ([P]E + TAPE]). Shortly afterwards, the ‘Party gathers to consume stale bread (6)’ (S[E]CT around EAT = SCEATT) and ‘Noisy reveller wrecked storey – engineers going up twice (9)’ (STOREY* + RE R[E]< + ROYSTERER). This is proving to be a very boozy crossword as mixed drinks follow. ‘Secretive type upset a bit of lager in brandy (4)’ (MAR[C]< round L(ager) giving CLAM) – and with those solutions in place we are speedily filling the grid. 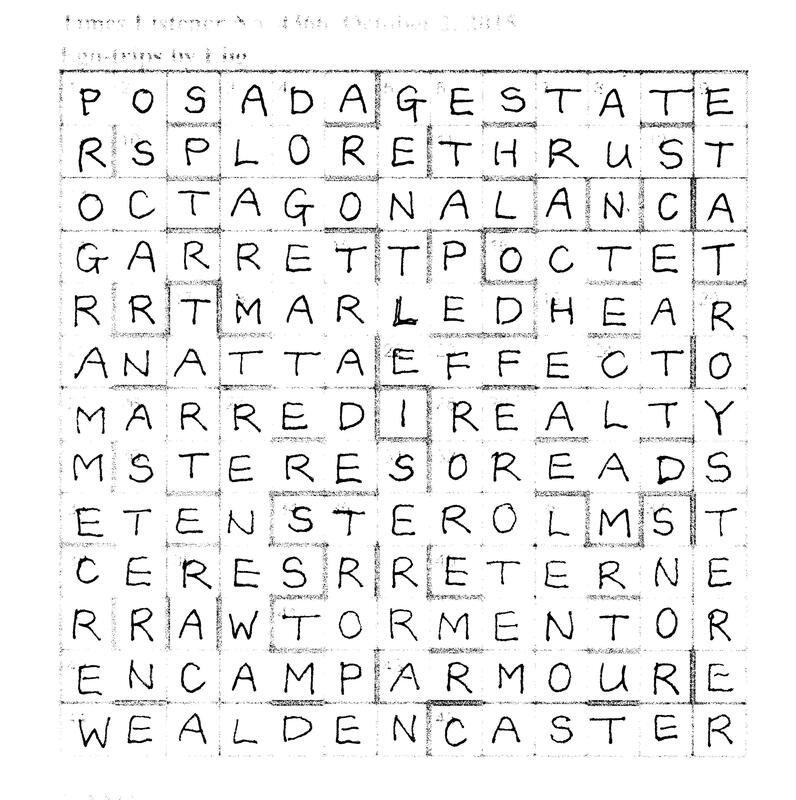 There’s a generous splashing of anagrams and we are maybe lucky in that we almost immediately spot that the clue to REALITY ‘Truth literally lost without Low Latin (7)’ is leading to a six letter word (LITERALLY less LL* = REALTY) though the given word-count is (7). Of course, we put the I in the centre cell, and that is confirmed when 25ac leads to MARRIED/MARRED, 5dn leads to GENTILE/GENTLE, and the fourth clue, completing the set of ‘four normally clued answers’ gives us SIERRAN/SERRAN. In the meantime, we have found most of the question produced by the extra letters and a quick Google hunt completes the question and its source, WHITHER SHALL I GO THEN FROM THY PRESENCE? PRAYER BOOK. Our grid is full and four ‘I’s have moved. Is that it? I wonder, but then realize that those were the only letter ‘I’s in Llig’s grid, and, indeed he needed to remove them from the relative words to create a kind of unity. 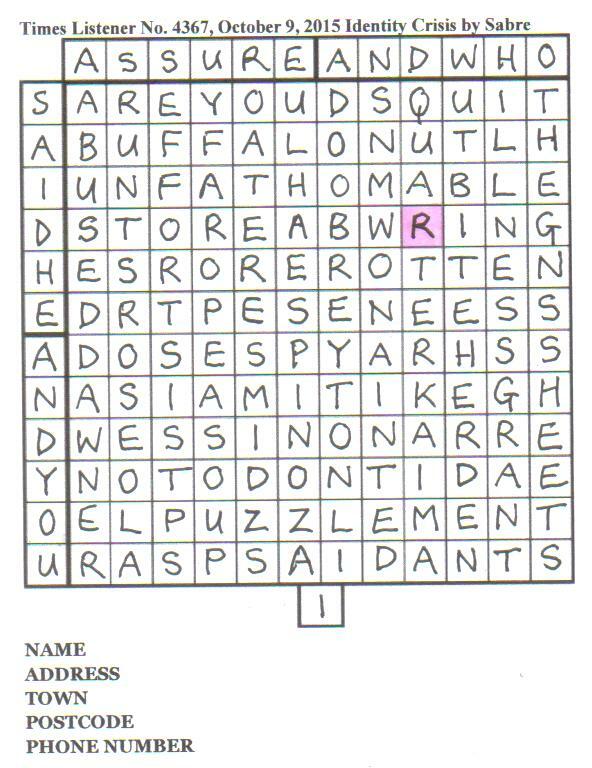 One could probably solve the entire crossword without spotting the lack of the letter I, so, in a way, Llig has created a task that is tougher on the setter than the solver. Thank you Llig for a relatively gentle and enjoyable solve. It left us time to enjoy a beautiful autumn evening.